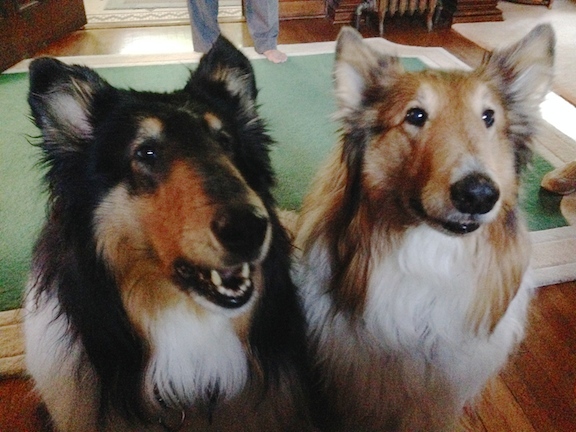 Smooth Collies Diva and Dusty were recently adopted into a home with another dog. Their new owner told me they were very well mannered and trained. Really there was only one problem – they refused to use the stairs to the basement. Its not unusual for dogs to be nervous or lack confidence when they encounter something they haven’t been exposed to. I have worked with dogs who refused to walk on linoleum floors because the shine was something they had never experienced before. This is why its so important to get your puppy exposure to as many new and different people, places and things when they are int he first year of their life. Puppies are usually fearless, so letting them gain exposure to new and different things helps ensure that they dont fear them once they mature. Its likely that Diva and Dusty were raised in a ranch style home and the lack of exposure to stairs makes them daunting. In this case, the matter was made worse by the narrow stairwell, shiny surface and a 90 degree turn at the bottom of the stairs. I have found its easier to get a dog to go up a set of stairs than down so we went into the basement through a storm cellar door outside. I started with Dusty, leashing him up then leading him to the cellar door. There was a short set of stairs to get into the basement through the cellar. To prevent them from being an issue, I walked towards them at a quicker pace to prevent Dusty from thinking about it. Dusty followed me down the stairs without any hesitation which was a good sign. I took him off the leash and walked behind him in a pseudo herding sort of way to the bottom of the stairs. Dusty went up two steps, then stopped. I tossed a high value meat treat on the next step up to see if that would encourage him. It did not. After some gentle nudging and a few other techniques proved unsuccessful, I started to manipulate his legs up the steps. I started with his front left paw, then his right before moving to his back left foot. As soon as I reached for his back right foot, Dusty started to move it on his own. First one step, then after a pause, he took another. After a few steps this way he found his footing and then marched all the way up the rest of the stairs. He was a little clumsy, but he did most of them on his own. I followed up the stairs behind him, then put him back on the leash and went out to the cellar door again. This time Dusty walked in front of me and took the cellar stairs on his own. Once we got inside I took the leash off again. Once I did, I motioned to the stairs. Dusty took a few steps over then paused so I encouraged him again. Once he got to the foot of the stairs, another pause. I tossed another meat treat up a few steps and this time, Dusty went up to get it on his own. After getting the treat, he trotted all the way up the rest of the stairs. I followed him up and gave him a few meat treats as a reward. After a quick break, I reverend the process, tossing a few treats to the top of the staircase. Dusty trotted over to gobble them up and I followed behind him. He started to try to move away from the stairs, but I blocked his exit. Once he stopped, I tossed a few treats down the stairs. Dusty looked up to me and so I encouraged him to get the treats. He turned, looked down the stars for a monument, then carefully walked down them – pausing to get the treats as he found them. When he got to the bottom of the stairs, I called him back up. He paused a bit for the first step, but then made his way all the way back up the stairs. I repeated this process with Diva who took a bit longer, but eventually responded the same way. After Diva had gone up and down the stairs a few times, I had the dogs going up and down the stairs at the same time until they did it with no further hesitation. I told their new owners that the dogs may need a little encouragement over the next few days, but after that, the fear of the stairs will disappear completely.